My earliest political memory -- the first time I consciously recall being part of a world larger than my hometown -- is from November 1979. I was seven years old and I have vague recollections of the first thirteen hostages from the "Iran hostage crisis" stepping off a plane that had just landed in the United States. It was shown on television, and I seem to recall a follow-up message from then-President Jimmy Carter, although that could have been older footage simply talking about the situation more generally at a previous news conference or something. I'm certain I didn't understand the broad picture of what was happening, but I do seem to remember that I understood that a lot of Americans were being held prisoner by some bad guys and that a few of them had just been let go. I mention that to emphasize that, despite being born while the Vietnam War was still going on, I have no direct memory of it. What's more, it was close enough to being current that it was never covered in any of my history books in school, but removed enough that it was never really addressed with regards to current events either. No one in my family served in Vietnam, and my friends parents at the time were either JUST a tad too young to have served or, if they had, never mentioned their service. My first, and for a long time primary, source of knowledge about the conflict was, sadly, Good Morning, Vietnam starring Robin Williams. As an adult, I've tried to rectify as many of the holes from my public school education as possible. (Although, that's a decidedly long-term and ongoing effort, given how badly in need of reform our school system is!) So I try to read up on things like the Vietnam War and watch documentaries on the Dust Bowl and just generally keep trying to incorporate knowledge I should have been made aware of decades ago. But beyond just getting the facts and figures, I also try to get some sense of the cultural and societal impact those types of events had. I mean, I've heard about anti-war protests, for example, but I'm sure they looked quite a bit different than the ones that I see on TV now. 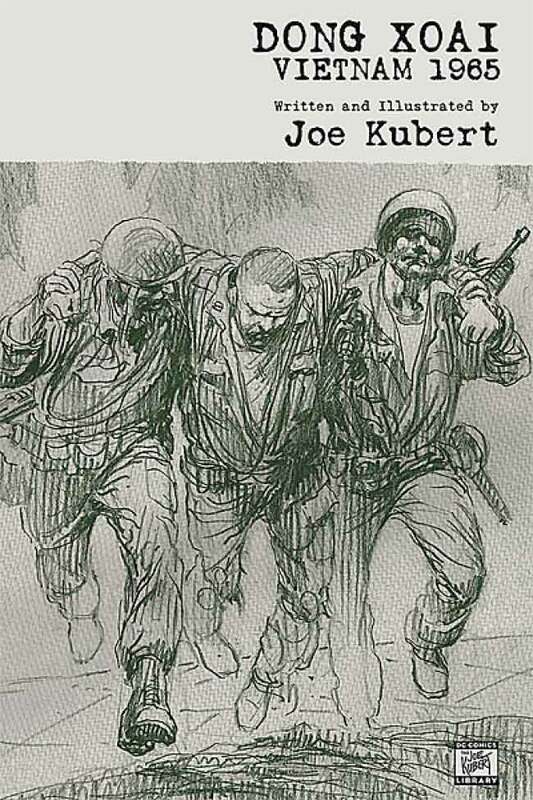 And that's how I come to Joe Kubert's Dong Xoai, Vietnam 1965. It's a story inspired by real events, but it's not actual history. The men who served as the story's inspiration have read it, and say that it has a sincerity and truth about it which factual accounts have not conveyed. This is the type of thing I'd like to see about Vietnam. This is what happened. Maybe not exactly how it happened, but this is how the men serving overseas lived. And died. I was, not surprisingly, first struck by Kubert's art. As evidenced on the cover, his work is shown uninked and raw. His initial layout sketch marks are left in place, and the only coloring are a few spot highlights with some white paint applied right on top of his pencils. (A technique I first saw, and became enamored with, in the still shots from Ralph Bakshi's Wizards.) Although certainly unnecessary at this point in his career, Kubert uses this technique to highlight what an incredible draftsman he is. Even the particularly rough sketches are gorgeously rendered and every page was a joy to look at. Interestingly, I was reminded of the last great graphic novel about Vietnam that I read: Will Eisner's Last Day in Vietnam. I recalled that, too, had a rough-hewn quality about it. When I went back to double-check, though, I noted that Eisner's work, while beautiful, was actually drawn and inked as he normally did, but had a textured pattern added afterwards that implied a less-polished feel. Where Kubert exceeded Eisner (wow - did I really just type that?!?) was in showing us the unrefined nature of war, using less elegant tools to emphasize the conflict itself. The story itself is solid too. Despite being based on real events of a different era, it could easily have slipped in alongside so many of the old Sgt. Rock comics Kubert had worked on decades earlier. The hordes of Viet Cong soldiers pouring over the earthen battlements. A wounded and anrgy Ssgt. Barton fighting on despite overwhelming odds. With a piece of shrapnel in his shoulder, Lt. Kelly looking out for those in worse shape. Seabees Stewart and Belasco missing the evacuation and having to hide in the jungle for days, trying to avoid capture or worse, before Dong Xoai is re-taken by USSF and ARVN troops. It's powerful stuff, to say the least. Called in times of war, these men are tried and tested in steel and fire. Battles are won and lost.. countries are broken and rise again... but the bravery of soldiers in war never flags or falters.